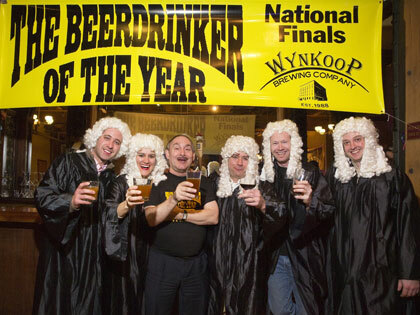 Warren Monteiro, a New York City freelance writer, beer traveler, homebrewer and beer columnist, was chosen as the 2013 Beerdrinker of the Year at Wynkoop Brewing Company in Denver. Kevin Cox of Muncie, Ind., and Jen Schwertman, a New York City bartender, were the other finalists. Monteiro has sampled beers throughout the United States, Europe, Central American, India, Sri Lanka and other nations. In 2012 he visited breweries and beer festivals in England, Belgium, the Netherlands and the US. He samples an average of 350 beers each year. For seven years, Monteiro has written his “Beer Sensei” column for the popular Ale Street News. His home beer bar is the Blind Tiger Ale House in New York City. For winning the 2013 title, Monteiro wins free beer for life at Wynkoop Brewing, a $250 bar tab at the Blind Tiger, and clothing proclaiming him the 2013 Beerdrinker of the Year. His name will be engraved on Wynkoop’s famed Beerdrinker of the Year trophy. For next year’s Beerdrinker of the Year contest, he’ll brew batch of beer of his own design at Wynkoop with head brewer Andy Brown.